Worried about a possible Fibre Cut? You should be. Though fibre is perceived as a “perfect” media, fibre is fragile and repairs take days or weeks requiring specialist skills and equipment. Consider a Gigabit Wireless resilience strategy for your fibre network to avoid downtime, unproductivity and loss of business for clients. The vast majority of corporate LAN connections, cable, Internet and LTE backhaul, is done over fibre optic cable. In one report CNN stated that about 99 percent of all international communications occur over undersea cabling. Alan Mauldin, research director at U.S.-based research firm Telegeography, noted that while some major cabling projects can come with high price tags, fibre optics is considered more robust and more cost-effective than common wireless alternatives like satellite. But while fibre optic cabling is traditionally seen as the safer option, that may be a misconception. When installed correctly, fibre optics is the “perfect” media, transmitting Gigabits of data without interruption. However, any disruption to the fragile fibre causes data outages which take days or weeks to locate and repair. The armoured covering around the fibre cable may keeps it safe from rodents but is no protection against mechanical diggers, street works and other forms of disruption. According to data from the Federal Communications Commission. about a quarter of all network outages that happened between 1993 and 2001 were from cables being cut. Regardless of how the fibre cut occurred, such outages can be particularly damaging. How easy is it to repair a fibre cut? Fibre is not a “self healing” media: skilled teams with specialist fibre-splicing and terminating equipment are required to repair a broken fibre connection. Most data communication engineers do not have this equipment or training on using them. Fibre repair is a specialist business and getting trained people and splicing equipment to site costs time and money. Factoring the anticipated cost of a fibre repair into a budget for “downtime” and “unproductivity” for corporates – and missing SLA’s for uptime for Service Providers – is a serious issue, including business continuity planning. For rural areas, access to sites can be limited, with some locations limited by poor weather, and for islands sometimes only with infrequent access by sea or air. By Accident – This is perhaps one of the most common causes of fibre cuts, but nevertheless they are just as damaging. In one example a 75-year-old woman in the country of Georgia was digging in a field when she accidentally severed a fibre optic cable, in an article in The Guardian. As a result of the mishap, close to 90 percent of Armenia and parts of Azerbaijan and Georgia were completely without Internet for five plus hours. By force of Nature – Tornadoes, hurricanes, earthquakes and other major natural disasters all have the potential to cut or entirely destroy fibre optic cabling. Other seemingly more benign forces of nature can also cripple connectivity, as Level 3 reported that 28 percent of all damages it sustained to its infrastructure in 2010 were caused by squirrels. In some locations, fibre installations are run on overhead “catenary wires” which render them at risk of outage with overhead activity and weather. In some of these fibre cut outage incidents, the fallout can be relatively minor. A cut that occurs in the middle of the night on a redundant line can be easy enough to deal with, with service providers sometimes able to reroute traffic in the interim. Unfortunately however, such incidents often lead to much bigger problems for end users. For example, a cut fibre optic cable in northern Arizona in April caused many thousands of people and businesses to go about 15 hours with telephone and Internet service. This meant many shops had to either close or resort to manual tracking, and that personal Internet usage grinded to a halt, The Associated Press reported. More importantly, 911 emergency communications were disrupted in the incident. It’s not just a hassle for end users, as cut fibre can severely impact public health when emergency services like police departments, fire stations and EMTs can’t take and receive calls. Plus, such incidents are very costly for service providers, forced to repair expensive infrastructure. They can also lead to canceled service, as customers become irate at service providers for failing to provide reliable connectivity at all times. What’s a solution to fibre cut outages? One easy way to avoid the problems related to cut fibre is to consider a wireless alternative to fibre as a resilient path. Using both fibre and wireless gives perfect network resilience. For example, if there is a disruption to the fibre optics at street level, the wireless links are up on rooftop level do not suffer – and vice versa. In one real-world example, after a cable outage caused residents of Washington state’s San Juan Islands to go without telephone, Internet and cell service for 10 days in 2013, CenturyLink installed a wireless mobile backhaul option there, according to The AP. By opting for a solution like a Gigabit Wireless Microwave, MMW, Free Space Optics or MIMO OFDM Radio, service providers gain a wireless alternative to cabling that is just as robust and fast as fibre. With the Gigabit Wireless link in place, cut fibre optic cabling is less disruptive to end users and ISPs. 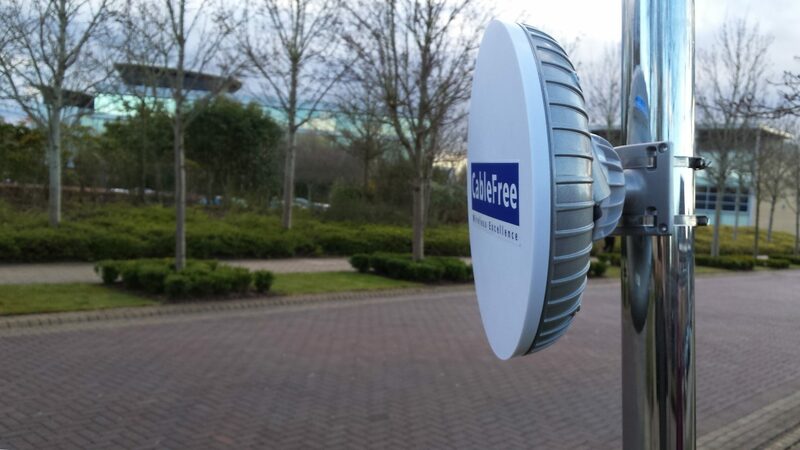 For More Information on CableFree Wireless Networking Products, please Contact Us and our team will be delighted to advise on a precise solution to match your exact requirements.